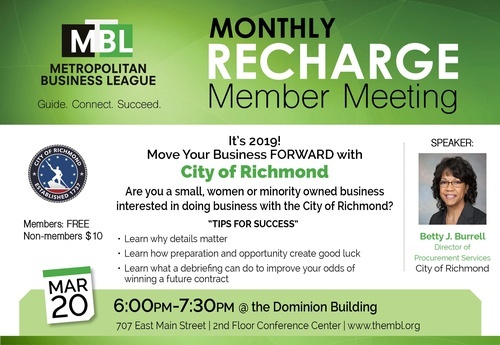 Betty J. Burrell is the current Director of Procurement Services for the City of Richmond. From 2011 to 2017, she served as the director of finance [retired] for Albemarle County, VA with responsibilities for five major division: Real Estate Assessor’s Office: Financial Management including payroll, accounts payable, procurement, and financial reporting; Risk Management; Financial Systems and Business Operations Management; and, Revenue Administration which performs Commissioner of the Revenue assessment and licensing functions, as well as tax and fee collections. From 2007 – 2011, she served as the chief Financial Officer for the City of Portsmouth, VA with responsibilities for Financial Management including payroll, accounts payable, and financial reporting; Risk Management; Procurement; Information Technology; Budget; among others. She was also the Director of Finance for the City of Fort Lauderdale, Florida; Tax Collector for Miami-Dade County including 32 incorporated cities; Deputy Director of Finance for the City of Richmond and elected Treasurer for New Kent County. Betty received her Master’s of Science in Administration from Central Michigan University, with a concentration in Public Administration and Bachelors of Business Administration from Averett University. She has received leadership training programs including Virginia Executive Institute, Advanced Government Finance Institute and Senior Executive Institute. This event is being brought to you by The Metropolitan Business League and its signature partners.